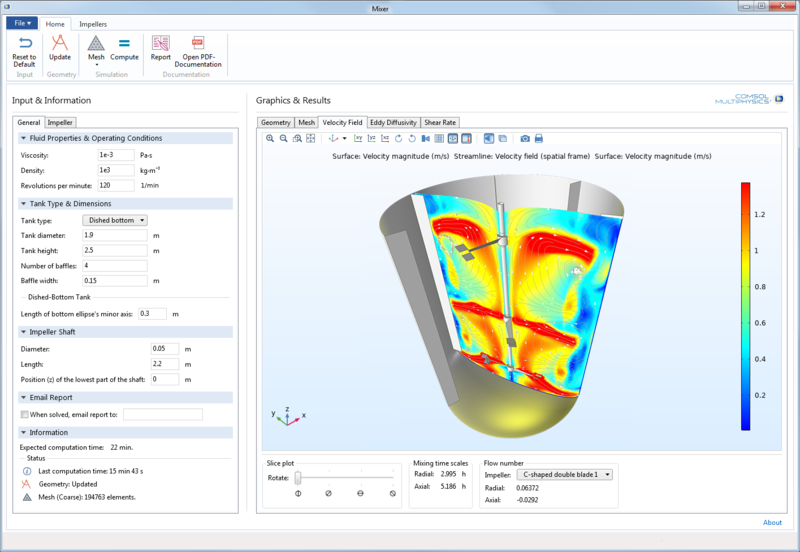 COMSOL Compiler™ enables you to share knowledge and expertise in the form of modeling and simulation applications with anyone in the world. Convert the applications you build in the COMSOL Multiphysics® software into standalone applications with the click of a button and deploy them to anyone you want. The compiled applications can be run without a COMSOL Multiphysics® or COMSOL Server™​ license, which gives you full control over your simulations, letting you distribute them at your own discretion. What Is the Difference Between COMSOL Compiler™ and COMSOL Server™? With COMSOL Compiler™, you can compile applications created with the Application Builder into standalone applications for the Windows® and Linux® operating systems and macOS. Applications are compiled with a simple click in the Application Builder user interface. You can provide your own splash screen and desktop icon by modifying the options in the Executable settings window in the Application Builder. The splash screen will be displayed upon starting the compiled application. You can compile an app into an executable file simply by clicking the Compile button in the Executable settings window made available with a COMSOL Compiler™ license. COMSOL Compiler™ is available as named single-user license, CPU-locked license, or floating network license options as an add-on to a COMSOL Multiphysics® license of the same type. COMSOL Compiler™ can be used to compile applications that include functionality from any add-on products to COMSOL Multiphysics® with the following exceptions: Material Library, PTC® Pro/ENGINEER®, PTC® Creo® Parametric™, and File Import for CATIA® V5. In addition, there is no support in compiled applications for synchronization with bidirectional interfaces for CAD software in the following products: LiveLink™ for SOLIDWORKS®, LiveLink™ for Inventor®, LiveLink™ for Revit®, LiveLink™ for AutoCAD®, and LiveLink™ for Solid Edge®. However, the CAD import functionality available in these products is supported. Compiled applications do not support the batch processing or cluster computing options of a COMSOL Multiphysics® Floating Network License.